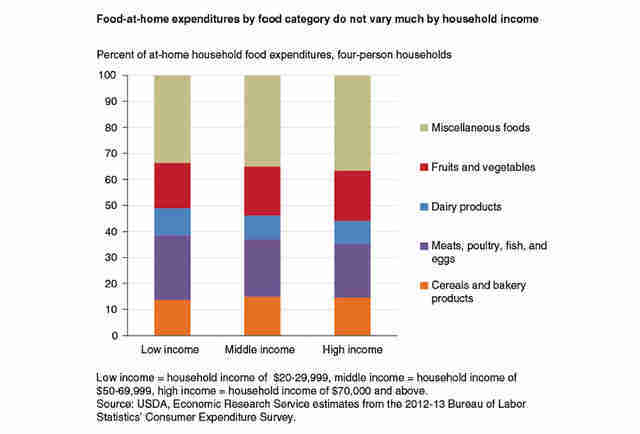 According to some recent graphics released by the USDA Economic Research Service, the typical American household allocates most of its food budget on meat and junk food. Other revelatory statistics that just missed the cut for the graphs: the sky is blue, water is wet, and white girls will consume anything with pumpkin spice branding. 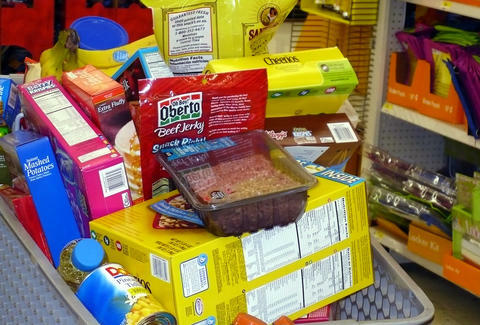 The pie chart on the left displays how your typical grocery haul should be broken down, according to USDA healthy diet standards. Vegetables should be the most prevalent purchase at 23%, followed closely by protein foods and a fair distribution of the other food groups -- besides "Other foods," which of course stands in for most everything unnatural and prepackaged (and delicious), at only 6.9%. The pie chart on the right is the actual breakdown of how we spend our food budgets. 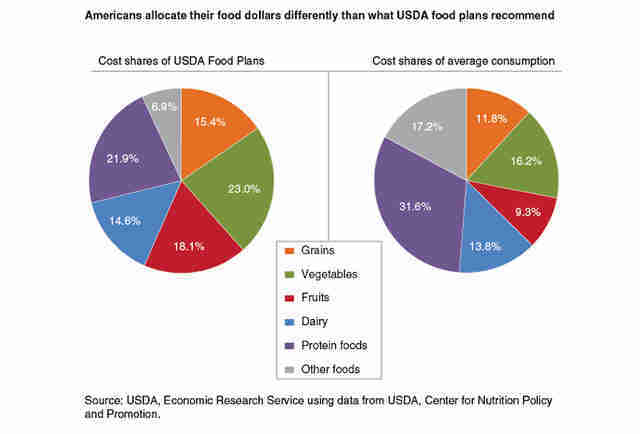 Obviously, we're not too keen on following USDA guidelines -- protein foods and other foods make up about half of the real life chart, with only dairy foods coming in even close to their suggested percentage of purchase. So yeah... we like fatty, sugary, meaty food. Interestingly enough, these unhealthy patterns were true across the board for Americans of all different income levels. After breaking the population down into brackets of Low income ($20-$29,999), Middle income ($50-$69,999, no word on what happened to the $30-$49,999 group, probably that disappearing middle class we keep hearing about), and High income ($70,000 plus), the percentages remained very close to the average of the population as a whole. Moral of the story: you should be buying more fruits, veggies, and grains. Oh, but that means you'll have to actually cook something? Never mind. snag another microwave dinner, throw it in the cart, and you're good to go. That's the American way. Brett Williams is an editorial assistant at Supercompressor. He only buys chips, salsa, and sriracha sauce.